A figure glides across a wooden stage, her dress a cascade of swirling psychedelic forms. The “Serpentine Dance,” one of many film experiments created by the Lumière Brothers between 1895 and 1900, is a kaleidoscopic display rendered in a single shot that stutters at sixteen frames per second. A single dancer moves across a dark proscenium, as her voluminous skirt creates heaving shapes and abstract bursts of expanding color. Staring at it for a moment, I’m reminded of the undulating fabric of ballroom dresses caught in flight down a baroque promenade, or of frantic time-lapses of flowers blossoming, an image that brings back old memories of somnolent afternoons spent in a middle school biology classroom. Hundreds of times a day new technologies are announced and advertised as being of immediate utility to the average consumer. Open the “New York Times” tech page or the app-store on your cellphone, and there they are in an endless succession. The 10-second “elevator” pitch, now a staple of every aspiring tech entrepreneur’s oratory, is also a testament to the ways in which information is minimized and reduced to its essence, as an indispensable part of a successful marketing strategy. Granted, the “Serpentine Dance” is a far cry from the antiseptic boardrooms of Silicon Valley. But it too expresses and demands the immediacy of its medium—motion, rendered in its most atomistic form. Originally this film was distributed as part of a program, whose fundamental aim was not necessarily its aesthetic content but a display of technologic fantasy. Even 117 years after it was made, we are still struck with an odd sense of wonder. The palpable pleasure of cranking a device by hand still resonates, and the frames burst forth, stuttering with movement. 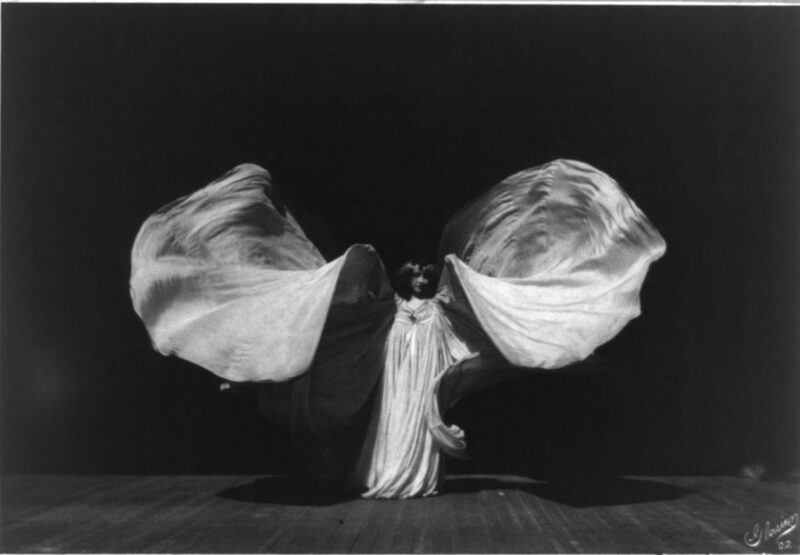 “The Serpentine Dance,” developed by Loie Fuller, who is often mistakenly identified as the dancer in the Lumière brothers’ film, became an avatar of the Art Nouveau movement in the late 1800s. Like the Lumières, she also engaged in technical experimentation, filing patents for the innovative lighting techniques she invented to complement her work on stage. Accordingly, the Lumières’ film presents several overlapping technologies that borrow from Fuller’s aesthetic experiments, new technologies latent in the birth of cinema, and (through the hand-tinting of its frames) the adaptation of techniques that presaged the various ways film could be manipulated. Although by no means the first film, the “Serpentine Dance” was distributed through a series of burlesque theaters and traveling exhibitions, for which the novelty of photographic motion was the defining feature. Yet, unlike many of their other early efforts—of a train approaching the camera, crowds moving through the street, a slapstick routine of a gardener attempting to water the plants of his garden while being tormented by a young boy—the “Serpentine Dance,” even with all its technical immaturity, expresses an imagistic sublimity. The work anticipates the trick shots and science fiction experiments that would soon become staples of the medium. Watching the film at this very moment, on a computer screen, embedded in a small window on YouTube, it appears like a haunted projection—an artifact of a technical language very alien to my own. But looking past its most dated elements, the flickering of the film in front of the projector, the grain that cascades like dander across the screen, it passes across the eyes like a strange dream with a familiar but mysterious destination.